Who knew actress Priyanka Chopra's whirlwind romance with former boybander Nick Jonas would become the epic love story of 2018? In her native India, Chopra has an elevated A-list status, cultivated after winning the Miss World title in 2000 and becoming one of biggest movie stars in the country. Not only that, but she successfully transitioned into mainstream Hollywood success, a previously unheardof feat. Jonas, on the other hand, is best known for his time in the Jonas Brothers and a number of high profile relationships, including with Delta Goodrem and Miley Cyrus. They are the unlikeliest couple to emerge this year, not because of the 10-year age gap the tabloids keep fussing over, but because they have emerged extraordinarily likeable. The couple have been on a full court press publicising their engagement and wedding after just a few months of dating, so much so that there were whispers of a showmance in recent months; but they halted any speculation about the veracity of their romance with a refreshingly honest Vogue interview. They featured as the mag's first 'digital cover stars', while Chopra is on the cover of the January print issue, but the feature was launched in time to coincide with their extensive wedding celebrations in India, which took place over three days. They exchanged vows in two ceremonies on Saturday and Sunday, the first one being a Christmas service officiated by Nick's father Kevin, and yesterday, with a traditional Hindu ceremony. In keeping with custom, Nick arrived to the Taj Umaid Bhawan Palace in Jodhpur - the same venue they had held their Western wedding - on horseback and wore a traditional outfit and turban, while Priyanka donned a red Sabyasachi sari. 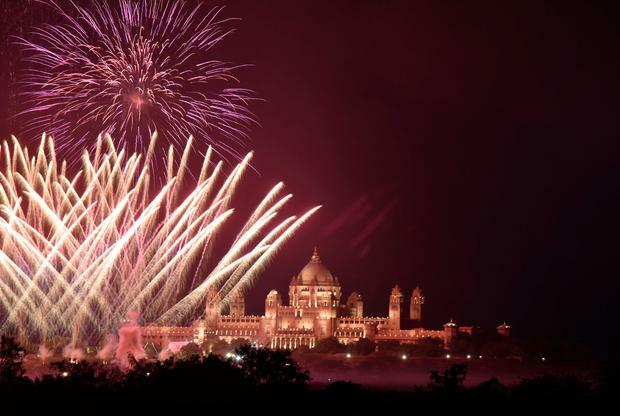 The second wedding featured a 40-ft high mandap, or canopy, adorned with red flowers, and the couple took part in many rituals, including riding an elephant together before taking part in the varmala, or garland, exchange ceremony. "Nick did a beautiful job following the customs of a Hindu ceremony, it was lovely seeing how they honoured both of their heritages," a source told E! News. 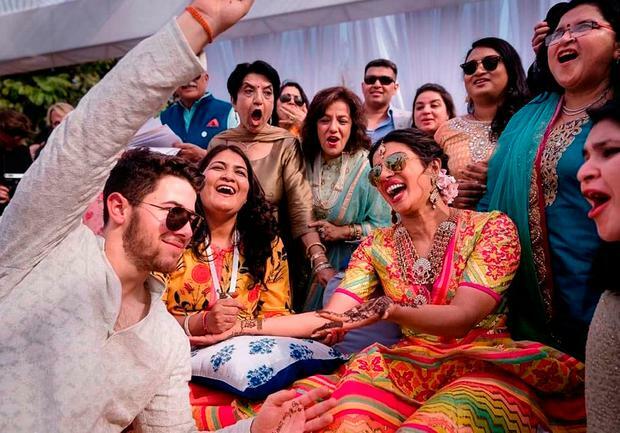 As part of the celebrations, the couple held a Sangeet, where their friends and family - including Nick's brother Joe Jonas - provided the entertainment. They both shared videos and images from the celebration on Instagram. Priyanka captioned her post: "It all began as a fierce song & dance competition between the families but ended, as always, as a huge celebration of love. "Nick and I were looking forward to the Sangeet (musical evening) and another pre wedding ritual.. and to see what each side had put together.And what a performance it was. Each family telling our stories through song and dance, filled with lots of laughter and love. We were both filled with gratitude for the effort, the love and the laughter and will carry the memories of this special evening for the rest of our lives. "It is an amazing start to a lifetime of togetherness for our families and friends.. #grateful. 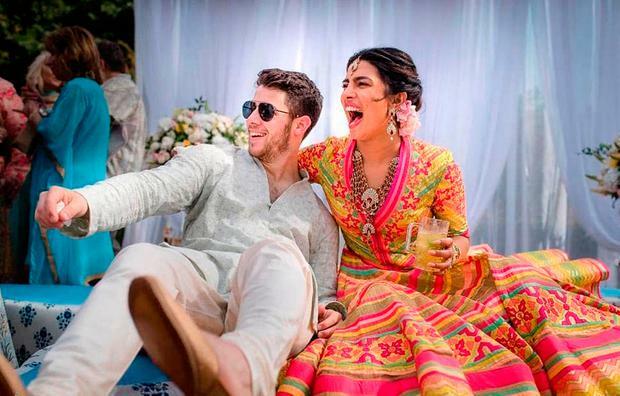 (sic)"
And Nick wrote: "Priyanka and I have been looking forward to the Sangeet (the musical evening and a pre-wedding ritual) to see what each side of the family had put together. "We're both so full of gratitude for the effort and love put forth by both families. What an amazing start to a lifetime!!" Hours before the Hindu wedding, the 'Quantico' actress took part in a haldi ritual, where haldi paste was applied to ward off evil and bring good fortune, as well as a chooda ceremony, in which she was gifted 21 bangles from family members, and a safa ceremony. The decor for the wedding was said to have included marigolds and the couple had a pink, orange, and purple colour scheme. Ahead of Sunday's ceremony, both families took part in a cricket match against one another. The couple have shared photos from their celebrations on social media throughout the weekend and admitted they were delighted to have been able to feature both their cultures and traditions. They wrote in identical posts: "One of the most special things that our relationship has given us is a merging of families who love and respect each other's faiths and cultures. "And so planning our wedding with an amalgamation of both was so so amazing. An important part for the girl in an Indian wedding is the Mehendi. Once again we made it our own." In the corresponding Vogue interview, Priyanka says she has been uncharacteristically forthcoming about their relationship because she's never felt this way before - and was always conscious of parading her private life around.